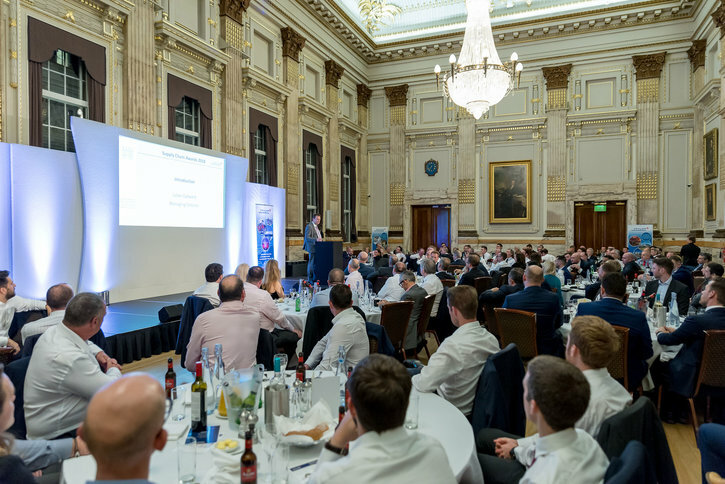 Taylor Woodrow held the inaugural Supply Chain Awards on Thursday 18th October at the ICE in London. Ten awards were handed out to successful supply chain members that had submitted into nine different categories. The evening began with an opening address from Neil Mant, Procurement and Supply Chain Director for VINCI Construction UK, who spoke about the importance of working closely and collaboratively with our supply chain and how important they are to what we do. Julian Gatward, Managing Director for Taylor Woodrow, then enforced this message by talking about how vital the supply chain are to delivering on Taylor Woodrow’s objectives and living our values, tying into the principles of ‘Delivering Together’. The whole evening was testament to both Taylor Woodrow’s commitment to engaging with our supply chain, but also the supply chain’s commitment to supporting and working together with Taylor Woodrow to improve a culture of collaboration and delivering together. Chevron demonstrated how they recruit from the widest possible pool of candidates, actively seeking to explore new areas such as; ex-military, ex-offenders, and apprenticeship Programmes. Employees contribute to creating and maintaining an inclusive environment through their FIR Ambassadors and Diversity Networks. Arup received this award for the use of point cloud survey data and high resolution imagery which allowed processes and tools to automate the design process and significantly reduce the time to produce detailed design and to greater accuracy. Acorn completed a complex and safety critical piece of work without any recorded or reported injuries by remote controlled plant and machinery that eliminated significant risks associated with HAVS and MH. Their managers and directors led from the front and by engaging with their workforce, reinforced key safety behaviours which contributed to the “Zero Harm Culture” across the contract. DMC Contracts demonstrated how quality was consistently achieved over a long period of time with the tiling at Tottenham Court Road Station Upgrade. During the design stages, they helped to overcome unique challenges proving that quality it not just about the end product but everything we do to deliver the outcome. Throughout the installation, a high standard of workmanship achieved not only a great looking product but also a snag free outcome. Waterman Group was handed this award for their positive, collaboratively flexible attitude and for their sound technical knowledge which enabled us to value engineer Taylor Woodrow’s designs both in our Allerton Project and energy tenders. Highly Commended – Pascall+Watson Ltd.
Tarmac have showcased a forward thinking, collaborative approach with Taylor Woodrow to jointly identify challenges and propose solutions. More specifically, they demonstrated their engagement by driving and coordinating regular technical workshops on the M20, and liaising with site and design teams to develop construction solutions that are safe, cost effective, buildable and efficient. This award has been given for the re-use of concrete sleepers on Old Oak Common which saved on the costs of manufacturing new, and transporting the old to be crushed and sent to landfill, and saved on lorry movement therefore reducing the carbon footprint. 14,000 sleepers were re-used. Existing non-serviceable timber sleepers were returned to Doncaster to their own Energy for Waste plant. Highly Commended – MJ Church Ltd.
P Flannery Plant have worked with Taylor Woodrow and the wider VINCI Group on a number of projects. They have a culture and future vision towards Plant rather than individual initiatives on specific projects. They have also helped to create minimum standards for the industry and provide familiarisation training for everyone regardless of the employer. This award has been given for Trackwork’s excellent Health and Safety record and their collaboration on Filton Bank with challenging timescales. The Judges Delivering Together award was a non-enterable category and the winner was chosen based on entries into other categories. CAN Geotechnical was chosen as they exemplify the principles of ‘Delivering Together’, a Taylor Woodrow initiative that sees us engaging regularly with our supply chain through workshops and driving a more cohesive and collaborative working environment. CAN Geotechnical were given this award for Delivering Together on the Filton Bank project.